We are delighted to announce a huge transformation of our online presence this week, by unveiling our brand new website, custom designed and built by Orqa Design in the UK! Over the past twenty years we have consistently aspired to provide the best customer service possible for our clients all over the world, and endeavoured to maintain and constantly improve upon our quality of cleaning services. Over the years we have been keeping up to date with the latest technology, funding independent research to continuously improve on industry standards, and putting the results of our new research into practice. 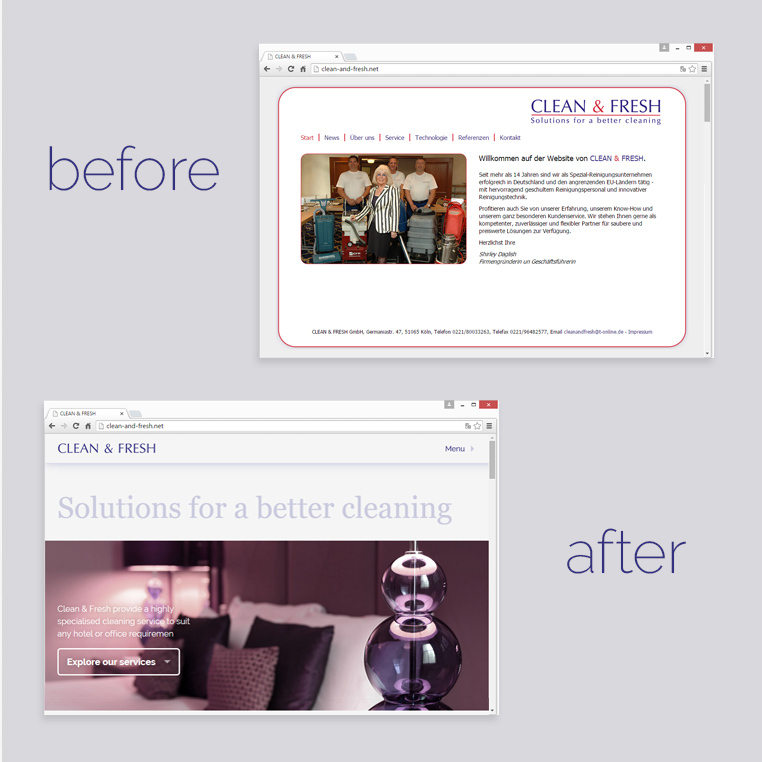 This year we decided that our website should better reflect our company's dedication to quality, progress, innovation and excellence within the cleaning industry. With this in mind we contacted Orqa Design, and began the process of creating an original, contemporary, stylish and state-of-the-art website to complement our company's ethos and achievements. Of course our brand new website, though beautiful and visually engaging, serves the core purpose of communicating our ethos and services to current and potential future clients. We have therefore endeavoured to provide all the relevant information necessary for clients to understand our company and the cleaning services we provide, and also to create a personal touch by introducing our team alongside our cleaning techniques and industry know-how. And of course we have supplied our all-important contact details, social media links and this blog to enable us to communicate with you in a variety of ways. Although presenting relevant information is the primary function of the website, we were keen to display this information in an interesting and captivating way. Rather than a static page view, we have therefore ensured that each page is not only visually appealing, clean and clear, but also has interesting transitions and moving elements to catch the eye. Our client testimonials are presented in a continuous sequential rotation, our esteemed client list slides across the screen in a pleasing sweeping movement, and pictures and icons change when you hover over them. We hope you all enjoy navigating around our new website. Although it has been a challenging process, we have thoroughly enjoyed working with Orqa Design to create our brand new, contemporary website. It has been a particular delight to hear from our current clients who have been so kind as to provide us with testimonials for this project. Speaking with you and hearing your feedback has been such a pleasure, and we look forward to continuing to provide you with our committed, professional and reliable service in the coming years. Please do get in touch to let us know what you think of our new site, or indeed if you are interested in any of our cleaning services. We look forward to hearing from you soon!